Members of Congregation Emeth receive the support, counsel, and guidance of a Rabbi who will assist them in challenging times and all life-cycle events. Since the time of Abraham, Jews have circumcised our newborn sons on their eighth day of life. Rabbi Israel will explain to parents the ceremony of brit milah, circumcision, and help the parents find a suitable mohel, a person trained in performing the circumcision as a religious rite. Usually, after the act of circumcision, the Rabbi will ceremoniously bestow the boy’s Hebrew name. The ceremony typically takes place at home. The celebration of the birth of a daughter features a ceremony during which the newborn receives her Hebrew name. Rabbi Israel will help parents design the ceremony, which can take place at home or the synagogue. Some parents chose to have the simchat bat on the eighth day of life, some prefer to have it at the synagogue on a Shabbat or any other day the Torah is read, and others simply choose the time most convenient for family and friends. Students preparing for bar/bat mitzvah at Congregation Emeth are trained to be knowledgeable Jews by attending Beit Sefer, Emeth’s programs of Jewish and Hebrew studies. Learning intensifies during the year preceding a student’s bar or bat mitzvah, when he or she learns to lead a Shabbat service and read from the Torah. After becoming a bar/bat mitzvah, an unusually high percentage of Congregation Emeth’s youth continue their studies and learn Jewish ethics and values in our teen program, Emet Dor Kef. Teens in grade 10, 11, or 12 may participate in a Confirmation ceremony after a program of study with Rabbi Israel. Rabbi Israel can help the bride and groom prepare their ceremony by teaching them its meaning, from the kiddushin to the ketubah to the nisuin under the chuppah to the groom’s breaking of the glass. She will also work with the couple in designing their ceremony. The Jewish approach to death and mourning is guided by four basic principles: Recognition of the reality of death, moderation in grief, respect for the dead, and equality in death. 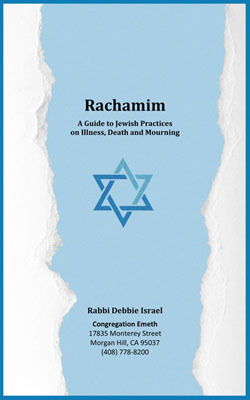 In the booklet Rachamim: A Guide to Jewish Practices on Illness, Death and Mourning, Rabbi Israel explains the practices of Congregation Emeth.Two forms in the guide that you may wish to review are Personal Wishes Upon Death (advance directives to be provided to your family and Rabbi), and Memorial Plaque Dedication, a means of remembering your loved one in perpetuity. Escorting the dead to their eternal home and supporting grieving families is an important mitzvah, and Rabbi Israel and Congregation Emeth’s Rachamim committee make this our highest priority in times of need.